A week ago on September 10, local and national organizations joined thousands around the country to literally raise their voices for abortion access. Their joint effort, All Access 2016, featured a main concert in Cleveland, four satellite events in Chicago, Philadelphia, Miami, and Atlanta, and additional local events and activities in 30+ cities. The Cleveland concert featured award winning singer Sia, Natalie Lafourcade, comedian Leslie Jones, and was emceed by Comedy Central's Jessica Williams. Other satellite events and local activities either livestreamed the main event, featured their own "homegrown" talent, or a mix of both. 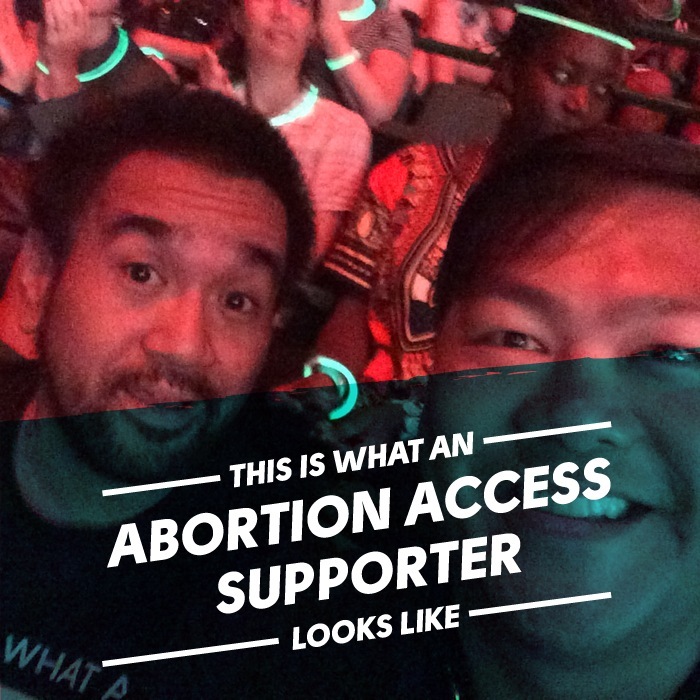 Throughout the events, the All Access 2016 team and its national partners highlighted real people sharing their stories about abortion and social media began to trend with a pictures showing "This is What an Abortion Supporter Looks Like." I was proud to work with the National Asian Pacific American Women's Forum (NAPAWF) to promote the event with local chapters around the country. As a card carrying member of the organization and a supporter for many years, I jumped at the opportunity to work more closely with NAPAWF sisters, siblings, allies, and partners to mobilize our Asian American and Pacific Islander (AAPI) communities around abortion access. As a gay son of Filipino immigrants, I've always found my values resonated with NAPAWF's vision of a world where liberated AAPI women and girls help build a more just and equal world for all of us. I've found common cause with my NAPAWF sisters and siblings fighting intersecting forms of oppression such as racism, homophobia, misogyny, transphobia, and xenophobia. Working with selfless volunteers around the country to promote All Access 2016 then, became both an exercise in realizing the power of passion unleashed through public service, and a reality check on how grassroots activists do more with less on a daily basis. Despite the limited amount of time and the multiple moving parts we asked volunteers to take hold of and move during the doldrums of summer, we shared in some real successes. In the Twin Cities, for example, Hmong queer activist Linda Her took the main stage and local AAPI organizations in Minnesota joined the NAPAWF Twin Cities chapter to cosponsor. In Seattle, Washington State Senator and proud South Asian immigrant woman Pramila Jayapal took time from her campaign to become the first South Asian woman to join the U.S. Congress to take part in the Seattle event. In Cleveland, I joined NAPAWF staff, volunteers, and friends to watch NAPAWF Executive Director Miriam Yeung take the stage to lead other national CEOs of All Access 2016 partners in a hilarious game show take off of "Family Feud" to educate the audience on abortion and what it means for our communities. Listening to Miriam, along with the other artists, advocates, and story tellers talk about their own poignant and personal stories about abortion made me realize how little I have stopped to think about what it means in my life. As a gay man who is not able to give birth, abortion has not been nor will it be something I will probably ever personally experience, but what All Access 2016 reminded me was that, whether I have it at the top of my head at any given moment, there are loved ones in my life who have had abortions, and that the choices they make about their own bodies builds the world around me. Because of and despite the very real and complex feelings people have on many sides of the many arguments around abortion access, women's lives and people's real access to abortion are threatened every day and that we have to trust them with the very simple yet very profound responsibility and liberty to make decisions over their own bodies and for their own families.